Broadcasted at 3.30pm, Thursday the 16th of October and airing every Thursday for 4 weeks. Gerry Keogh is Chief Fire Officer at Dublin Airport and explains the procedures and challenges involved in this critical and necessary role. Willie Kirwan is a fire fighter at the airport and as an employee of thirty years has a unique story to tell. Vincent Barrett is an airport policeman and along with Louise Wilson who is involved with emergency planning gives us a glimpse into their day-to-day operations. 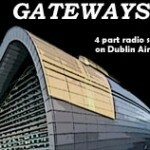 Declan Keane is operations Manager at the airport and Declan guides us around the airport’s busy control room. David Hendron is an architect with Pascall Watson, the firm behind the design of the new Terminal Two building. David outlines the design process and describes how the finished award winning building was achieved. Edel Bourke is CEO of The Airport Credit Union and is well placed to describe the role the credit union has played in the lives of airport workers through out the years. Linda Murphy is a Revenue Officer dog handler at Dublin Airport and outlines the unusual role of custom’s sniffer dogs.